All About Shanghai: A Standard Guidebook. Oxford: Oxford University Press, 1983. First published by the University Press, Shanghai, 1934. Jacob and Aaron Avshalomov, Avshalomov’s Winding Way. USA: Xlibris, 2002. Paul De Barros, Jackson Street After Hours: the Roots of Jazz in Seattle. Sasquatch Books, 1993. Amanda Bennett and Sidney Rittenberg, The Man Who Stayed Behind. Chapel Hill: Duke University Press, 2001. Gao Bei, The Chinese Nationalist Government’s Policy toward European Jewish Refugees during World War II. Modern China, Vol. 37, No. 2, March 2011. Buck Clayton, Buck Clayton’s Jazz World. New York: Oxford University Press, 1987. 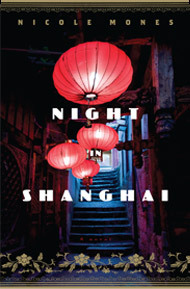 Stella Dong, Shanghai: The Rise and Fall of a Decadent City. New York: HarperCollins, 2000. Andrew David Field, Shanghai’s Dancing World: Cabaret Culture and Urban Politics, 1919-1954. Hong Kong: The Chinese University Press, 2010. Poshek Fu, Passivity, Resistance, and Collaboration: Intellectual Choices in Occupied Shanghai, 1937-1945. Stanford: Stanford University Press, 1993. Langdon Gilkey, Shantung Compound: The Story of Men and Women Under Pressure. HarperOne, 1975. Ernest G. Heppner, Shanghai Refuge: A Memoir of the World War II Jewish Ghetto. Lincoln: The University of Nebraska Press, 1993. Joy Homer, Dawn Watch in China. Cambridge: The Riverside Press, 1941. Langston Hughes, I Wonder As I Wander. New York: Farrar Straus & Giroux, 1960. Andrew F. Jones, Yellow Music: Media Culture and Colonial Modernity in the Chinese Jazz Age. Duke University Press, 2001. Leo Ou-fan Lee, Shanghai Modern: The Flowering of a New Urban Culture in China 1930-1945. Cambridge: Harvard University Press, 1999. Hanchao Lu, Beyond The Neon Lights: Everyday Shanghai in the Early Twentieth Century. Berkeley: University of California Press, 1999. Lynn Pan, Old Shanghai: Gangsters in Paradise. Hong Kong: Heinemann Asia, 1984. Lynn Pan, In Search of Old Shanghai. Hong Kong: Joint Publishing Co., 1982. Lynn Pan, Shanghai Style: Art and Design Between the Wars. San Francisco: Long River Press 2008. Desmond Power, The Jazz Scene at Japanese Prison Camps in China. West Vancouver, B.C., Canada: June 2012. Gunther Schuller, The Swing Era: The Development of Jazz, 1930-1945. New York: Oxford University Press, 1989. Margaret Stanley, Foreigners in Areas of China Under Communist Jurisdiction Before 1949: Biographical Notes and a Comprehensive Bibliography of the Yenan Hui. Reference Series Number Three, The Center for East Asian Studies, The University of Kansas, 1987. Ross Terrill, The White-Boned Demon. New York: William Morrow and Company, 1984. The Chinese Plan for a Jewish Resettlement during the War of Resistance Against Japan: The Ardent Efforts of Sun Fo and H.H. Kung. Unauthored article in Chinese military history archives, translated by Daniel Nieh, 2011. The Louis-Philippe Messelier Archive 2012. Vincent Messelier-Gouze Copyright. The Black Heritage Society of Washington State, Inc. THE VIEWS OR OPINIONS EXPRESSED IN THIS WEBSITE, AND THE CONTEXT IN WHICH THE IMAGES ARE USED, DO NOT NECESSARILY REFLECT THE VIEWS OR POLICY OF, NOR IMPLY APPROVAL OR ENDORSEMENT BY, THE UNITED STATES HOLOCAUST MEMORIAL MUSEUM.